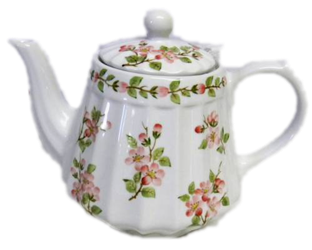 Pink apple blossoms and green leaves decorate this white four cup teapot. The teapot measures 6.5" tall and is both dishwasher and microwave safe. Pink apple blossoms and green leaves decorate this white, scalloped shape four cup teapot by Sadak. The teapot measures 6.5" tall and is both dishwasher and microwave safe.